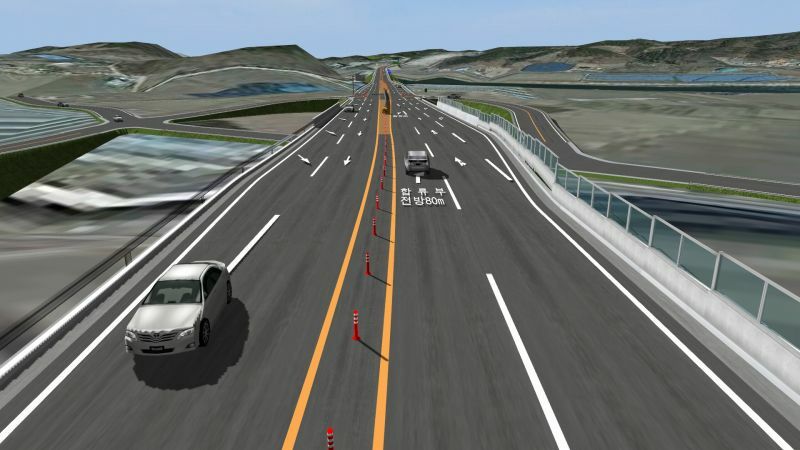 Plans to divert and regulate traffic around an intersection near the "Tokachi Ohashi bridge" undergoing repair work was put on trial via VR simulation. The VR technology was used to visualize the regulation plan in order to confirm drivers' visibility during night and winter, procedure for diverting and regulating traffic, and the predicted traffic flow itself, which in turn helped shed lights on potential problems prior to plans being enforced. 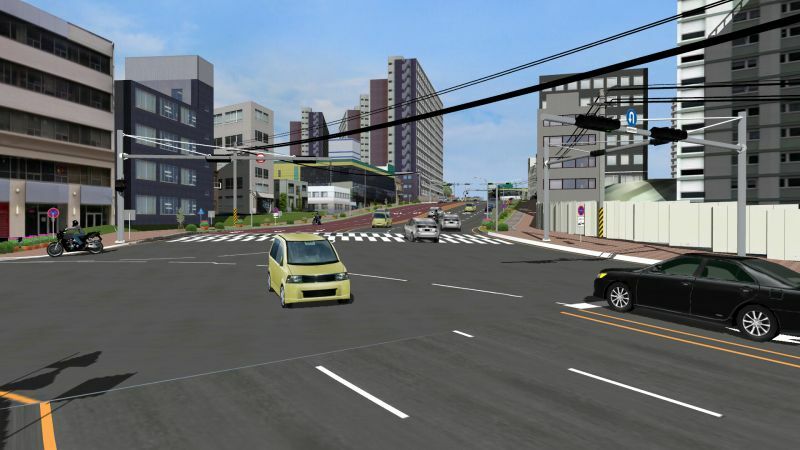 This VR traffic simulation for traffic regulation was featured at a "Conference on CIM" hosted by Japan Society of Civil Engineers which took place in Sapporo on July 5th, 2013, as a case study on the use of CIM in construction. Executing the animation allows you to see the explanation on the simulation of regulated traffic. Moreover, executing the scenario enables you to see what it's like driving through regulated traffic under various conditions. QUBE wished to improve the training of drivers who unload or load 700,000 new imported and exported vehicles per year from the Pure Car Carrier (PCC) ships that dock in Australia from around the world. QUBE's aim is to achieve Zero Damage to the vehicles being unloaded. The solution is the PCC simulator. 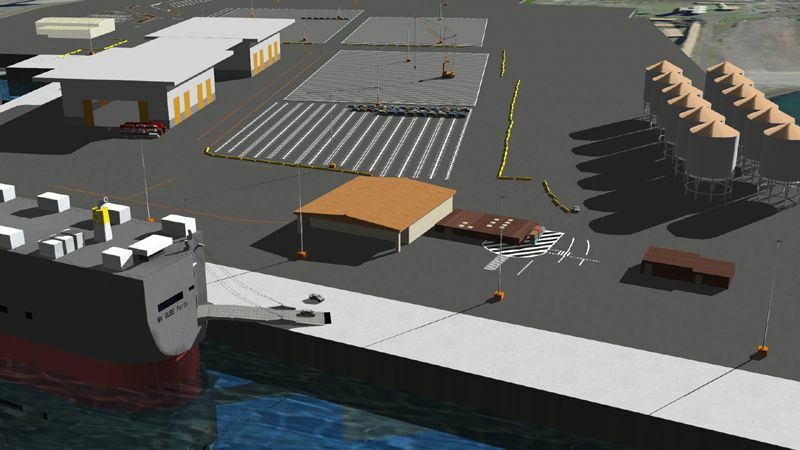 The PCC simulator consists of a drive simulator with a 3D virtual model of a PCC ship and the wharf to which the vehicles are unloaded and parked. A new Driver Training and Assessment system permits a Trainer to select a driving scenario for the driver seated in the simulator, who then drives in the 3D virtual model, down a number of ramps in the ship to the wharf and then to a specified parking spot. He may encounter a number of hazards and different day/night and weather conditions, and also is required to keep to certain speeds and maintain safe distances with obstacles and cars in front. At the end of the drive he is assessed for correct operating procedure and driving skill, against criteria that also include maintaining an ideal route, manueovring skills, parking accuracy, collision risk control, steering and pedal control. Both trainer and driver are able to view a real-time replay of the drive, which assists in pinpointing areas for improvement. Executing the animation allows you to see the overview of ship and driving situation. Moreover executing the 5 scenarios enables you to experience unloading in the different kinds of scenes. Tsunami analysis results that take into account the dynamic movement of wave and traffic analysis results extracted by traffic simulation using micro models of vehicular traffic during an emergency were combined to elicit the overall result of tsunami analysis in the course of consulting for measures against tsunami. By visualizing these results within the same VR environment for assessment, they were able to conceive measures far more effective than these devised using the previous consulting scheme. 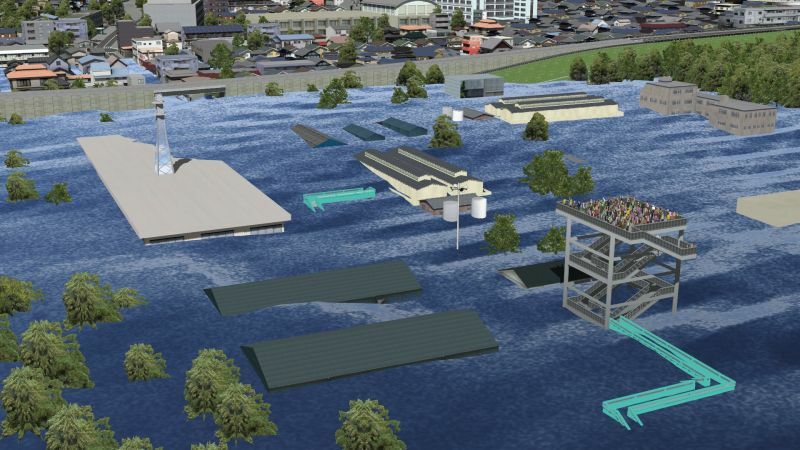 Executing the animation allows you to see the evacuation situation in the event of tsunami occurs and tsunami prevention measures in VR environment. Flash movie shows the images before and after measures are taken. A Driving Simulator designed to give you the feel of driving while being seated on an intelligent seat. The simulator is equipped with "Lateral support feature" that keeps your body from being thrown to the side while you are cornering, "Movable driver seat and backrest" that helps your shoulder turn easier when steering, and "Forward Collision avoidance system" that keeps you in correct driving posture and tightens your seat belt to prepare for collision. Executing the animation allows you to see the explanation on the "Intelligent Seat". Executing the scenario enables you to experience driving on a course used for the simulator. An area above and below ground level stretching 300 meters on all 4 directions from the south side of JR Osaka station was modeled within the 3D VR environment. Accurately reproduced buildings together with roads and underground shopping mall on which vehicles and pedestrians are made to travel provided the most suitable VR environment for simulating vehicle and pedestrian behavior, controling traffic signals, analyzing crowd behavior in underground alleys and validating the effectiveness of signages and evacuation guidance in terms of safely evacuating people to a safe place, all of which are research initiatives in quest for optimizing the future society via ITC. 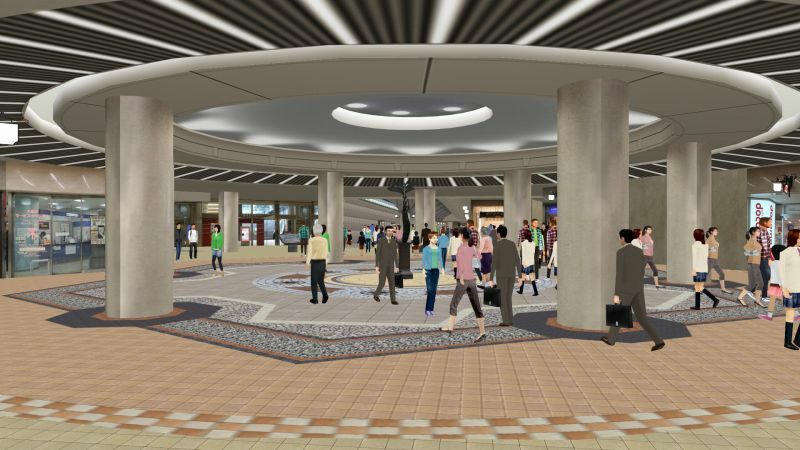 An area above and below ground of JR Osaka station are expressed in VR environment. Executing the animation allows you to see the traffic situation on ground, the crowd walking inside the underground shopping mall, and people evacuating in the event of the emergency. The Korean Ministry of Land, Infrastructure and Transport is planning to construct a type of road (2+1) new to Korea. 2+1 road is comprised of 2 lanes each serving traffic going in the direction opposite to each other, and a passing lane. 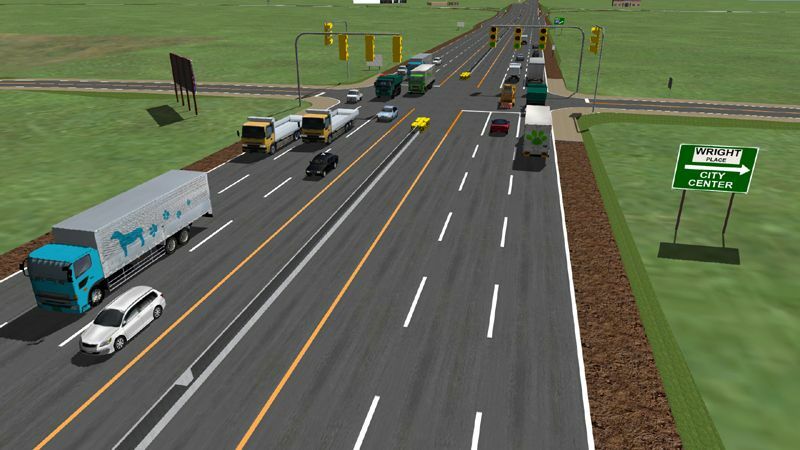 As the building cost is cheaper than that of building 4 lane road, the plan is put forward, however most drivers are not used to driving on this new type of road, and hence the driving simulator was used to evaluate its safety. A model of 13km road that represents the 2+1 road was created, and the condition and behavior of 50 test drivers while they drove on the passing lane of the virtual road was analyzed by looking at the log that are output in real-time which describes the accelerator and brake position, speed, and offsets from the center line, and also by counting the brain pulse of the drivers and tracking their eyes. The analysis result was used as a source for verifying the safetyness of the new road. Executing the animation allows you to see the structure of a new type of road "2+1". 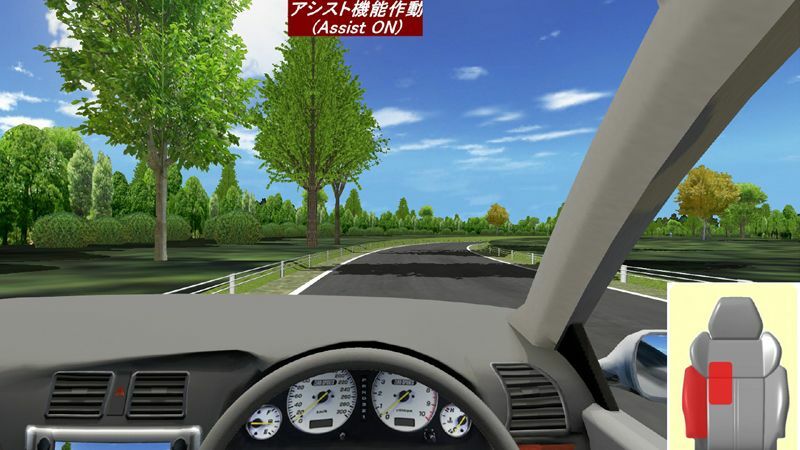 Moreover executing the scenario enables you to experience driving on the actual road. 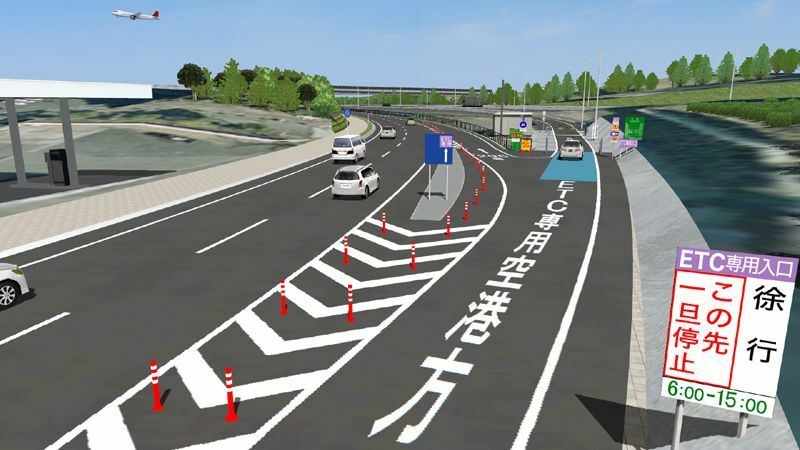 A plan to connect 2 roads running on the east and westside of town built in line with the Japan City Planning Act is underway. The plan includes installing crosswalks and bike lanes to keep students going to and from school safe, and building overpass and pedestrian tunnels. 3D VR model of the planned design was created to give local residents a better picture of how the site would look like after construction at meetings. VR data in which the construction plan of the urban highway is visualized. Executing the animation allows you to watch the construction process, overpass and see what's it like driving at night. It is possible to see the situation around the construction site from various viewpoints and switch the time by selecting the context. and switch the time by selecting the context. Installing railway bridges for single track railway is a challenging task because they tend to be situated at a place that provide limited space for crane movement such as a train station's platform or a mountainous region. Then there is the issue of bridges being destroyed by a cloudburst which we see happening lately. 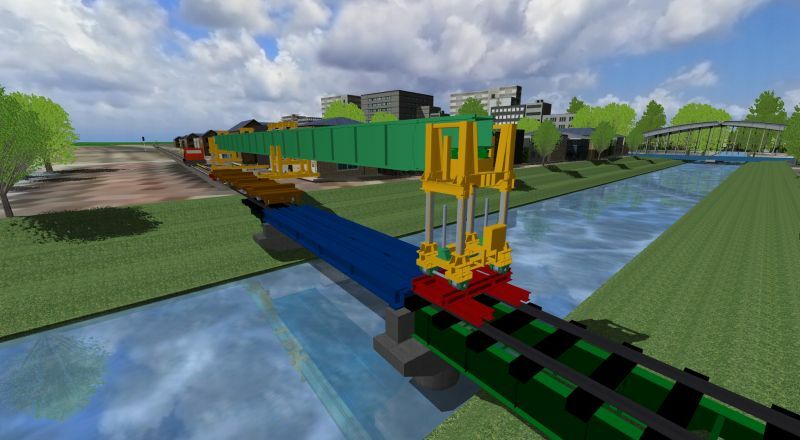 A smart engineering method for installing these railway bridges that can withstand heavily rain at a place where space is an issue was proposed using VR technology. Executing the animation allows you to see the explanation of the engineering method. It is possible to see the situation around the construction site from the various points of view and switch the time by selecting the context. The Korean Ministry of Land, Infrastructure and Transport and Korean Transportation Safety Authority investigates the actual road and traffic condition on the nation's roads and highways every year to evaluate their safety. Areas that fall below the country's Traffic Safety Index and Traffic Safety Culture Index require improvement. To propose the solution plan with new road alighment and road facilities for these areas, the current condition and the proposed plan was reproduced as VR environment using UC-win/Road, and included them within documents to be submitted for approval. Executing the animation allows you to see safety measures at the intended spots. Moreover it is possible to switch from the traffic state before measures were taken to the traffic state after measures were taken or vice versa by selecting the camera position. 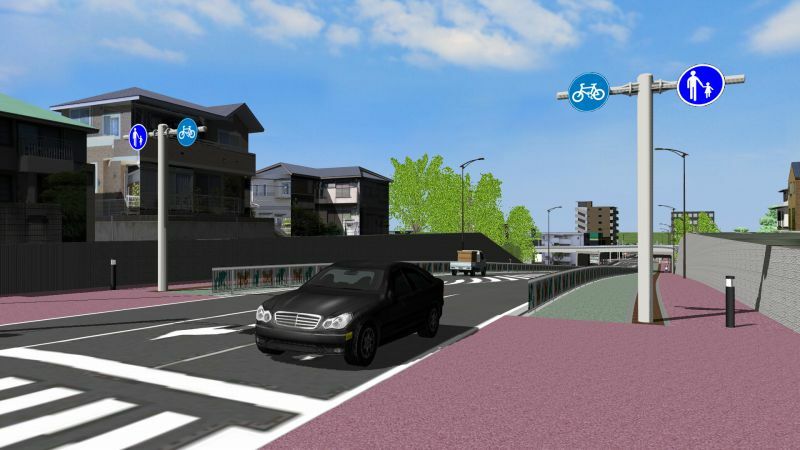 VR was used to promote safety and use of the Narita Smart Interchange, which consequently streamlined business! 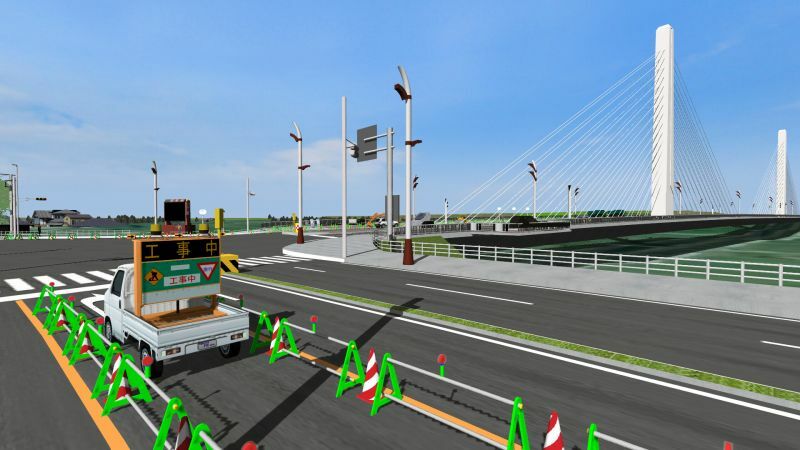 VR model of the Narita Smart Interchange, which was built to mitigate traffic congestion, was created during off-hours as means of decreasing traffic accidents in the interchange and encouraging more drivers to take it, consequently streamlining all types of business related to the interchange. In particular, this virtual environment was designed for use with driving simulation scenarios to test different sign design and the visibilty of signs for safety measures. The driving simulator was showcased in a local festival in the city of Narita where it drew a big crowd and encouraged more public activities and also contributed to questionaries being filled out by more people. Further developments are planned. Executing the animation allows you to see what's it like travelling on highway with smart IC en route to the airport. Moreover executing scenario enables you to experience what's it like driving through smart IC. VSAT's 3D VR Training Environment built using UC-win/Road is situated on a 16 square mile land comprised of highways with on/off ramps, city streets, intersections, railway crossings, Driving Agility Cone Courses, etc. and hosts various driving hazards and training scenarios designed to enable students to experience common driving situations and hazards, while guided by their instructor that control environmental conditions and scenarios using the Simulator Control Station, developed using the SDK, from a separate screen. Simulator Control Station also tracks the scenario progress and the position of the driven vehicle using an overhead view of the land area used. In a Driving Agility Cone Course that also serves as training environment for Emergency Vehicle drivers, the Control Station keeps track of how many cones were touched, and how many were knocked down by the driver to evaluate their maneuvering skills. VSAT's 3D VR Training Environment is indeed the most effective driver training system, as students can use the driving simulator "full screen" that provide peripherial vision while the instructor controls weather, time of day, visibility (fog and haze), road conditions, and viewing distance from the Simulator Control Station, without students being able to predict the next driving environment and scenarios. The instructor can also control traffic density in each of the major training areas, the city, the highway, and the Interstate Freeway. A driver training environment designed to teach driving skills. Executing the animation allows you to see a drive through the training environment that shows various parts (city, highway, cone course etc) of the training course. Moreover executing the scenario enables you to experience driving through the training environment and replay dangerous scenes. 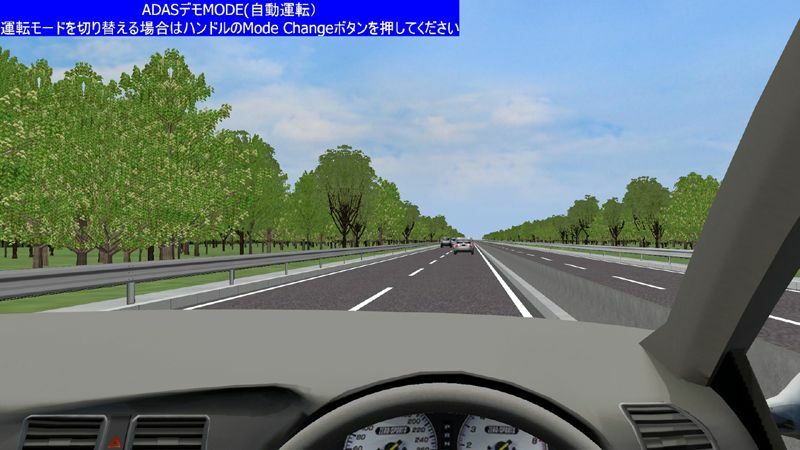 VR simulator, an excellent tool for reproducing various driving environments, was used for dangerous scene assessment in the disicpline of in-vehicle ADAS (Advanced Driver Assistance System). The ADAS device was interfaced with the VR simulator to be used for the assessment, which consequently helped build the kind of development environment that allows all the advantages of VR technology to be exploit. This is a data to be used for dangerous scene assessment in the disicpline of in-vehicle ADAS (Advanced Driver Assistance System). Executing the animation allows you to see the explanation of the system. Moreover, executing the scenario enables you to experience driving on a test.